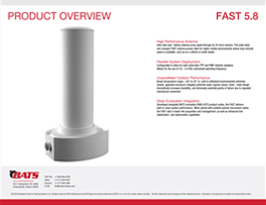 The FAST is a purpose-built automatic antenna alignment & stabilization solution designed for maintaining point to point links while on the move in high-speed mobile environments. Ideal for deployments requiring mobile operation, the FAST represents a flexible solution for operators looking for reliable Line-of-Sight (LoS) communications in a small package. Ultra-fast (sub- 500ns) antenna array speed through its 24 micro sectors. The solid-state and compact FAST antenna proves ideal for highly-mobile environments where only minimal space is available, such as on a vehicle or small vessel. Configurable to allow for both subscriber PTP and PMP network solutions Allows for the use of 4.4 – 5.0 GHz NATO operating frequency. Broad temperature range, (-30° to 55° C), built to withstand environmental extremes Sealed, gasketed enclosure mitigates potential water ingress issues. Solid – state design dramatically increases durability, and eliminates potential points of failure due to repeated mechanical movement. 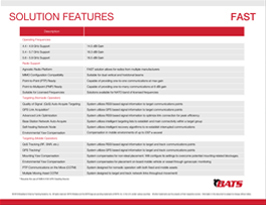 Developed alongside BATS innovative DVM & BTS product suites, the FAST delivers best-in-class system performance. When paired with suitable partner microwave radios, the FAST aids in faster link acquisition and management; as well as enhanced link stabilization and optimization capabilites.